Customers cannot remember all products that they love but haven't purchased for the last shopping. 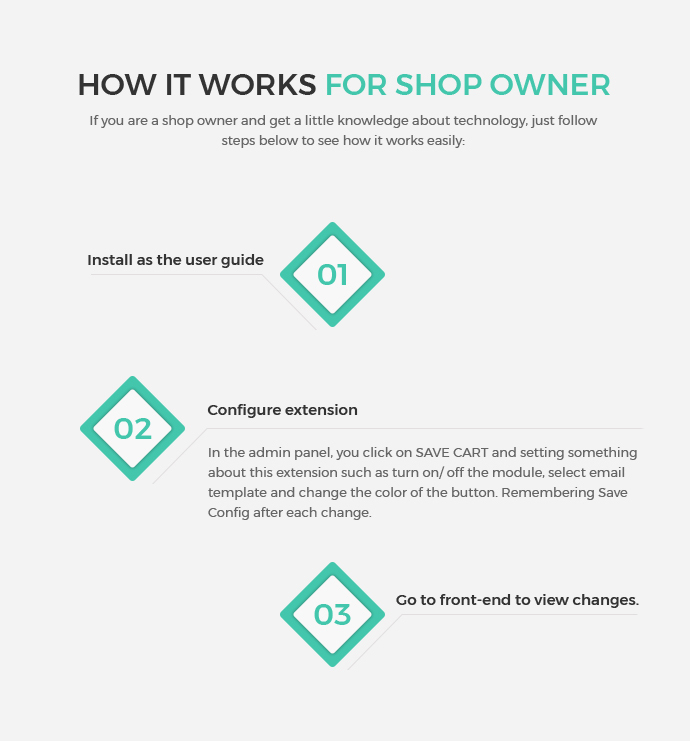 Therefore, Save Cart Extension for Magento 2 is the great extension to help customers save their favorite items in their cart for the next purchasing. + Create many purchase conversion and increase revenue for the shop owner. + Customers can add products to cart and click "Save Cart" button on shopping cart page to save it for later purchase or modification. + After saving cart, customers can give a name for this cart. + Customers can see the entire saved cart in their "My Account" section. + Customers can remove cart in "My Saved Cart" tab of My Account or use button "Use cart" to add this save cart to cart. 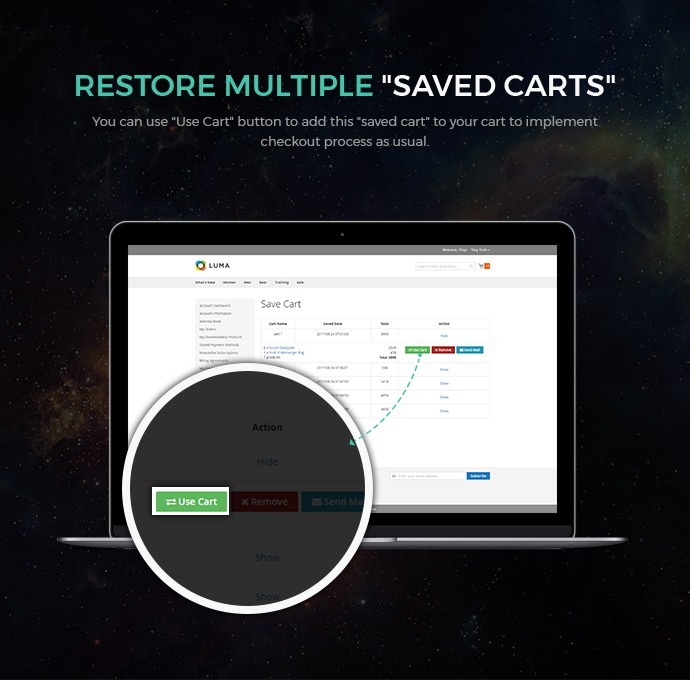 + Customers can save multiple carts. + To more convenient for the customer when sharing save cart by email. 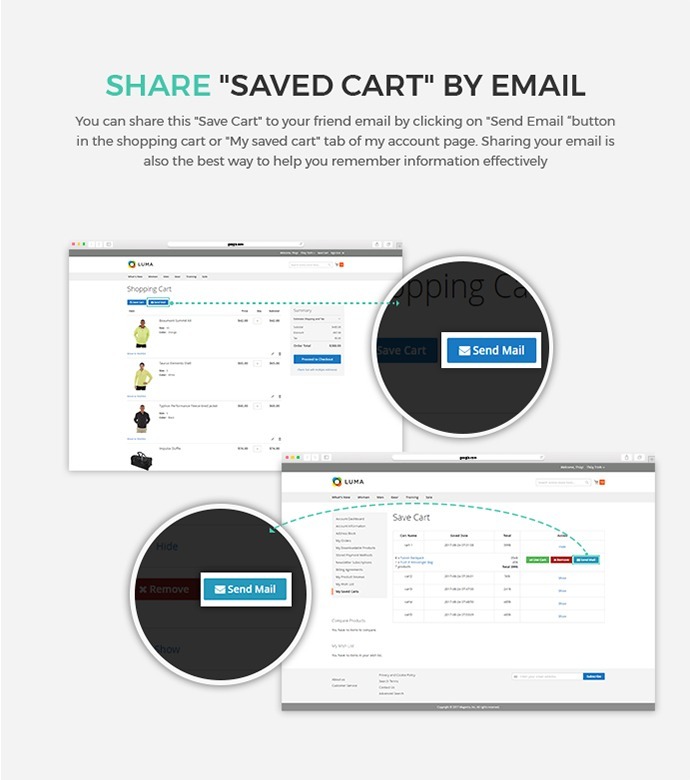 It helps you share "Saved Cart" with friends or themselves. 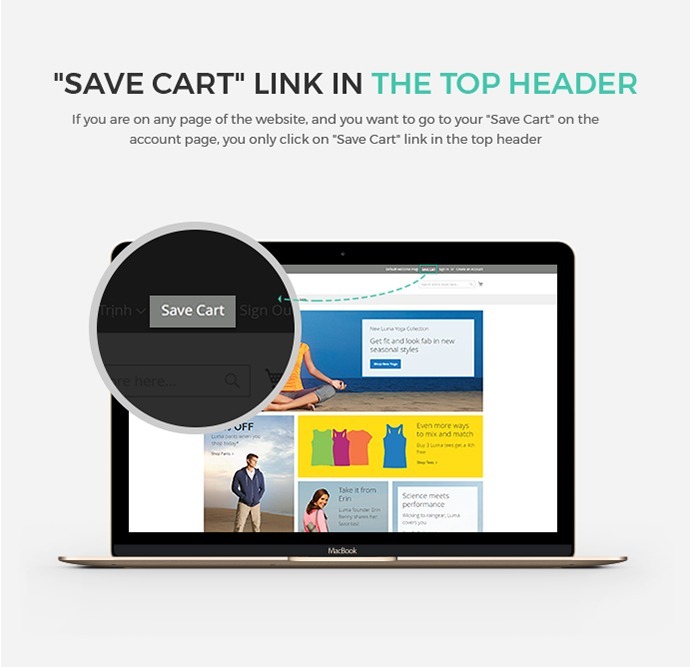 They can open email anywhere to view "Save Cart" without going to a website. Step 3: Add products to cart: Go to the detail of product you want to buy and choose an option (if any). Then, you click on the "Add to Cart" button to add the product to cart. 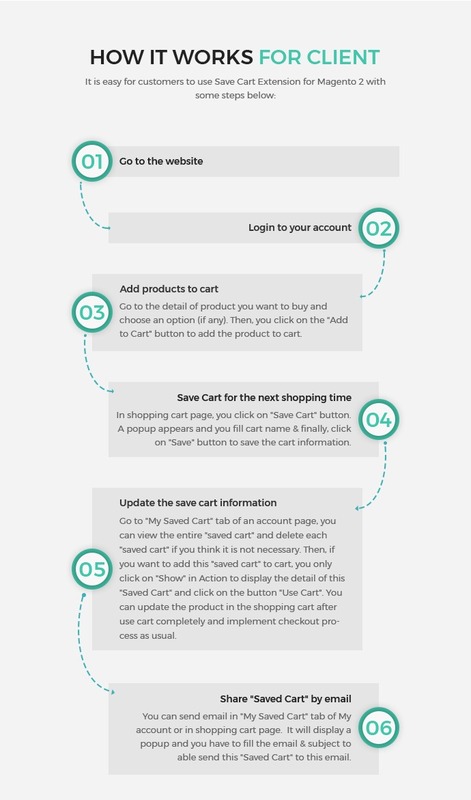 Step 4: Save Cart for the next shopping time: In shopping cart page, you click on "Save Cart" button. A popup appears and you fill cart name & finally, click on "Save" button to save the cart information. Step 5: Update the save cart information: Go to "My Saved Cart" tab of an account page, you can view the entire "saved cart" and delete each "saved cart" if you think it is not necessary. Then, if you want to add this "saved cart" to cart, you only click on "Show" in Action to display the detail of this "Saved Cart" and click on the button "Use Cart". You can update the product in the shopping cart after use cart completely and implement checkout process as usual. Step 6: Share "Saved Cart" by email: You can send email in "My Saved Cart" tab of My account or in shopping cart page. It will display a popup and you have to fill the email & subject to able send this "Saved Cart" to this email. Step 2. 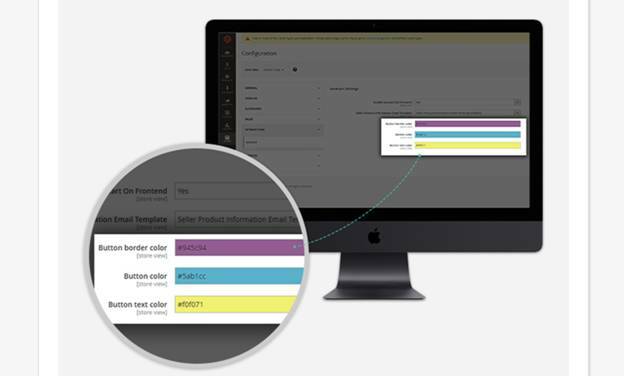 Configure extension: In the admin panel, you click on SAVE CART and setting something about this extension such as turn on/ off the module, select email template and change the color of the button. Remembering Save Config after each change. Step 3: Go to front-end to view changes. Create a "Save Cart" in the shopping process: When you add items to your cart but with some seasons, you can save cart with "Save Cart" button on shopping cart page. 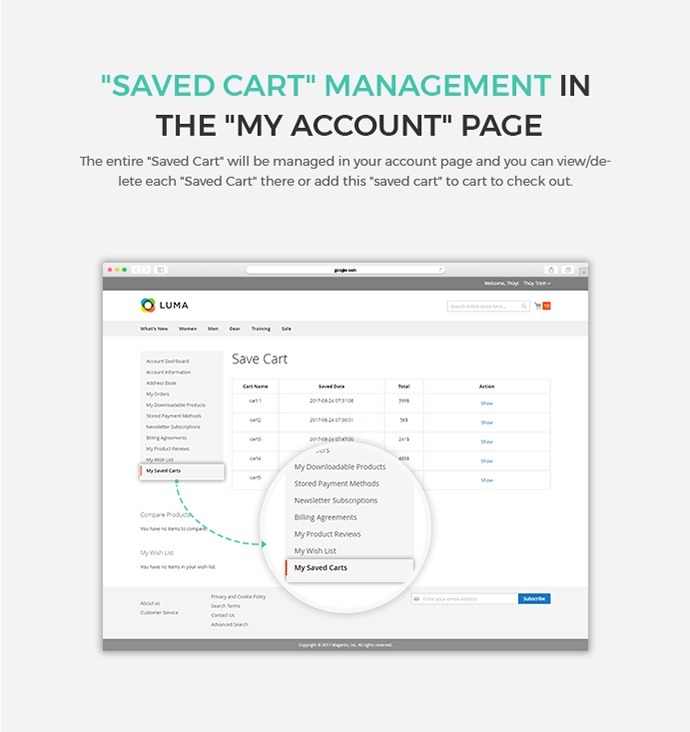 "Saved Cart" Management in the "My account" page: The entire "Saved Cart" will be managed in your account page and you can view/delete each "Saved Cart" there or add this "saved cart" to cart to check out. 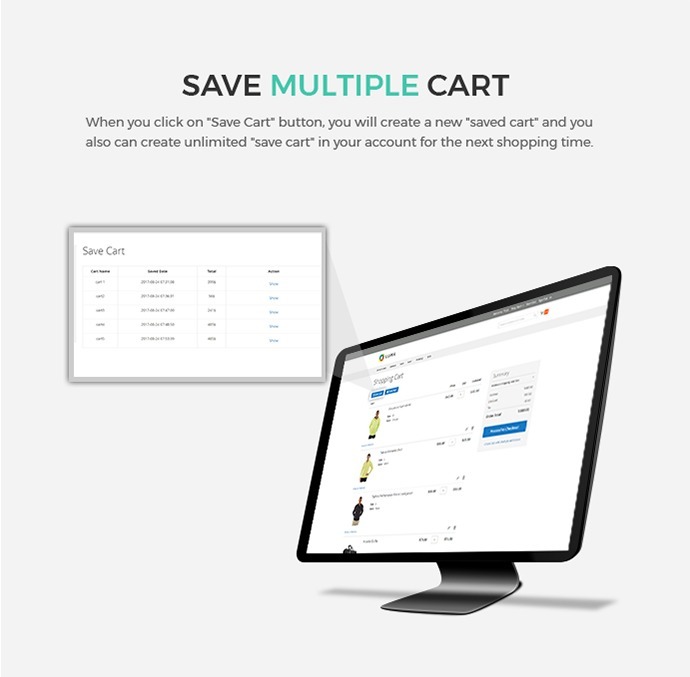 Save Multiple Cart: When you click on "Save Cart" button, you will create a new "saved cart" and you also can create unlimited "save cart" in your account for the next shopping time. Restore multiple "Saved Carts": You can use "Use Cart" button to add this "saved cart" to your cart to implement checkout process as usual. Share "Saved Cart" by email: You can share this "Save Cart" to your friend email by clicking on "Send Email "button in the shopping cart or "My saved cart" tab of my account page. Sharing your email is also the best way to help you remember information effectively. "Save Cart" link in The Top Header: If you are on any page of the website, and you want to go to your "Save Cart" on the account page, you only click on "Save Cart" link in the top header. 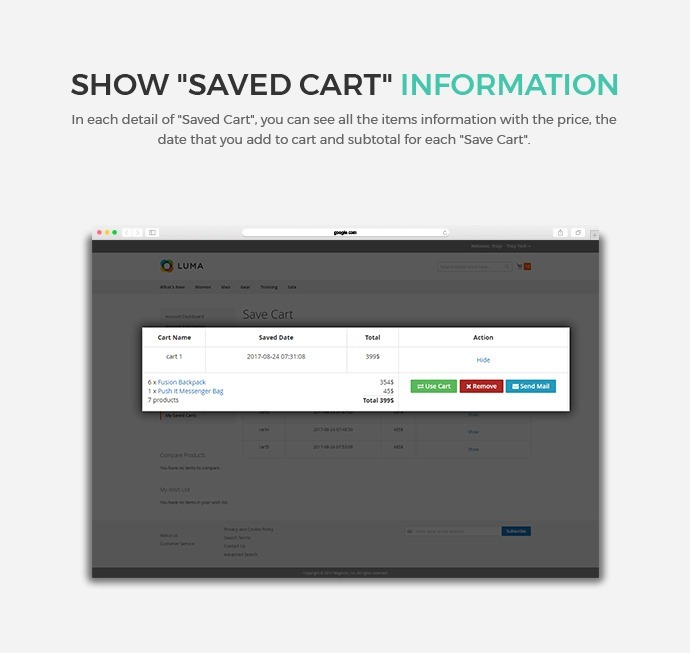 Give a name for each "Saved Cart": After you click on "Save Cart" button in shopping cart page, a popup appears and customers have to fill the name of their "Saved Cart". 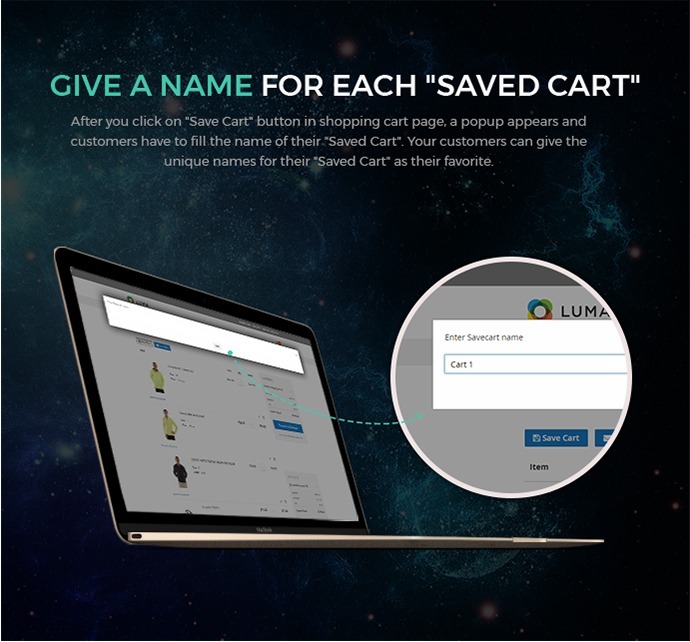 Your customers can give the unique names for their "Saved Cart" as their favorite. Show "Saved Cart" information: In each detail of "Saved Cart", you can see all the items information with the price, the date that you add to cart and subtotal for each "Save Cart". Customize Color: You can change the colors as text color, border color, the background color of some buttons as: "Save Cart" button on the shopping cart page, buttons in "My Saved Cart" tab in my account page. 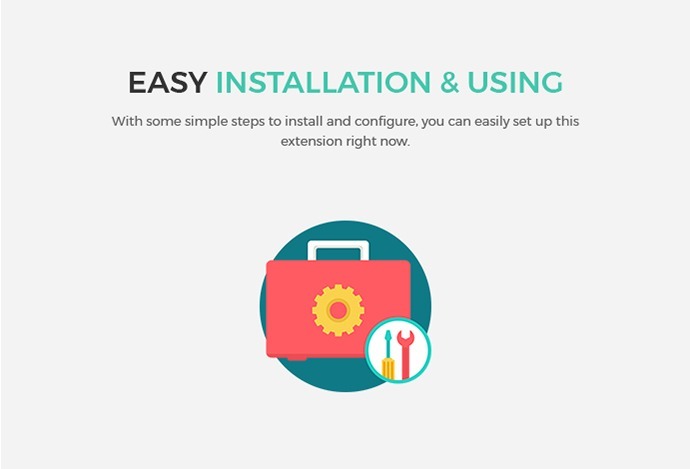 Easy installation & using: With some simple steps to install and configure, you can easily set up this extension right now. Compatible with any theme: It is easy to integrate this product into any Magento 2 theme and it will increase your revenue immediately. Is this Save Cart Extension for Magento 2 responsive? Can I Customize Color of Save Cart Button? Yes, you can. You can change the colors as text color, border color, the background color of some buttons as: "Save Cart" button on the shopping cart page, or buttons in "My Saved Cart" tab in my account page. How to create a Save Cart? What actions can user do with Save Cart? How many “Save Cart” can admin create in account? 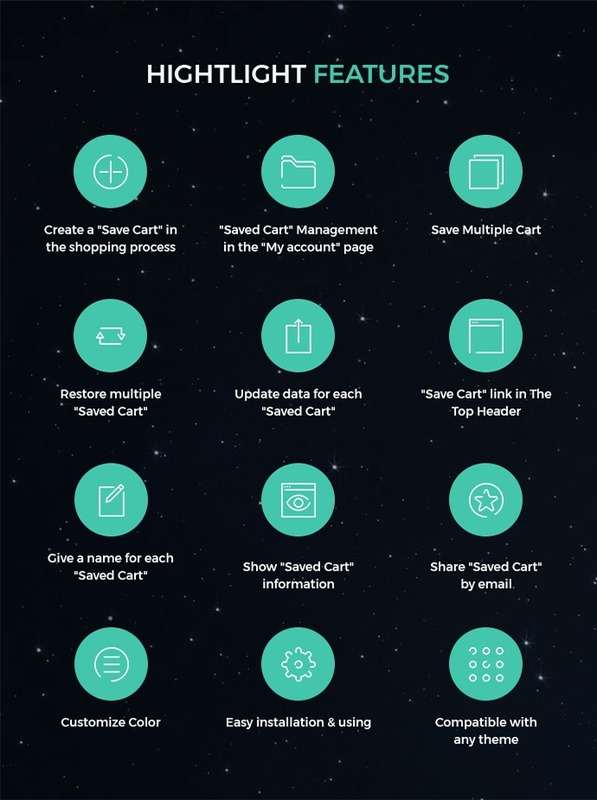 You can create unlimited "save cart" in your account for the next shopping time. Yes, you can. In each detail of "Saved Cart", you can see all the items information with the price, the date that you add to cart and subtotal for each "Save Cart". Yes, it does. All themes or extensions of Magento support all kinds of languages. You just need to install our language packages and then translate it into your wanted languages. Our Dev team will guide you how to make it. Is it possible to install this extension on multiple domains? Yes, it is possible to install Save Cart Extension for Magento 2 on many domains. It depends on the number of domain license support that you purchase. Why haven't i received the downloadable link after i made a purchase? Taking care of customers at the smallest point is very important, encouraging them to get loyalty to your products and web-store. Thus, in order to evaluate the position of a web-store, experts always list must-have indicators including user-experience, satisfaction level of customers and whether they are willing to introduce your products and web-shop to others. Promoting your performance and user-experience is the first key to achieve all. 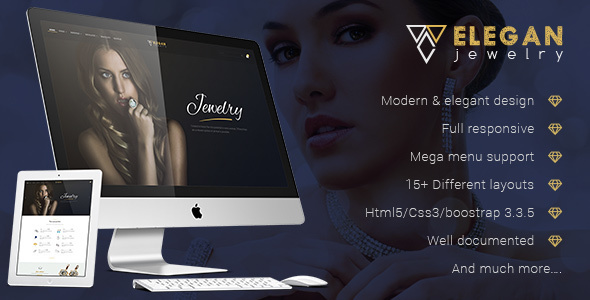 Actually, driving your web-shop on Magento 2 platform is an advantage for your e-commerce. Magento 2 has been upgraded from the version 1 and updated a huge range of awesome features of high-performance, loading speed and more. More importantly, thanks for the development; it has a deep foundation of Solution providers on the market with additional extensions. Among them, Save Cart extension has been remarked as the first time. 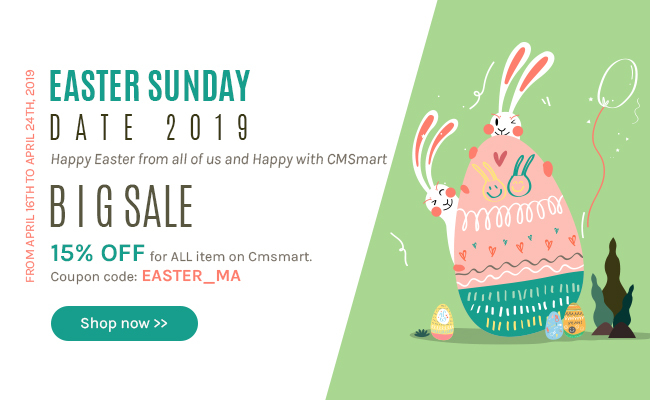 Magento 2 Save Cart extension is a new release of Cmsmart’s Team. As you may know, CMSmart’s team is one of the leading providers of Magento e-commerce currently. With their products, you can save more time for both you and users, as well as effective and high profit. Today, we will introduce the Magento 2 Save Cart extension, resolving a necessary need of your customers, saving them as your loyal audiences. This new extension is created in hope of allowing customers to save their conference list of your products for the next purchase. For some reasons, they like certain products but do not complete the check out step. They can save their selected products in to Save Cart and continue doing shopping for the next time. It is not necessary to search for products or information of them because they have saved them as the future cart. So it is very convenient for your customers, also helping you receive more sales and loyal customers. After installing the module into your Magento 2 web-store, you can add the Save Cart button right on the Top Menu tab for customers to easily get. Benefits of Magento 2 Save Cart extension bring a new way for customers to save their time and create a good conference source of online shopping for themselves. 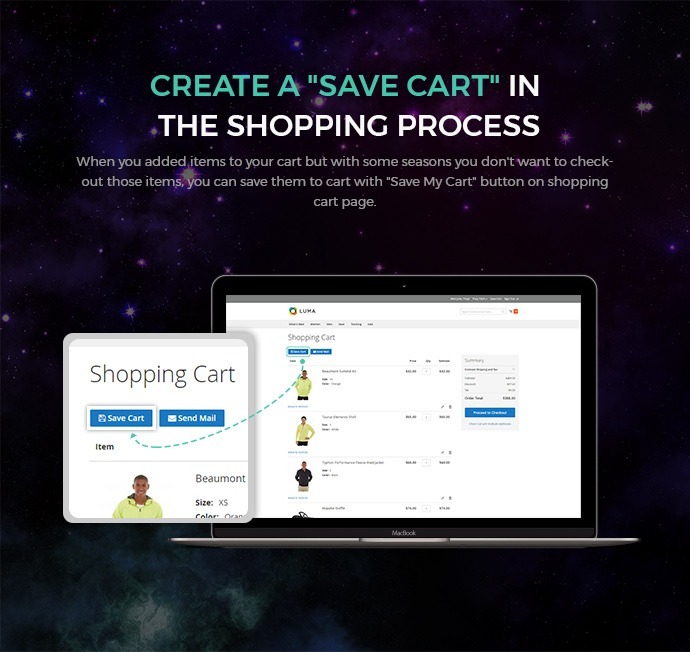 Customers are able to create Save Cart in the shopping process by clicking on the Save Cart button on the shopping page if they have not purchased items and want to save them as the next shopping time. 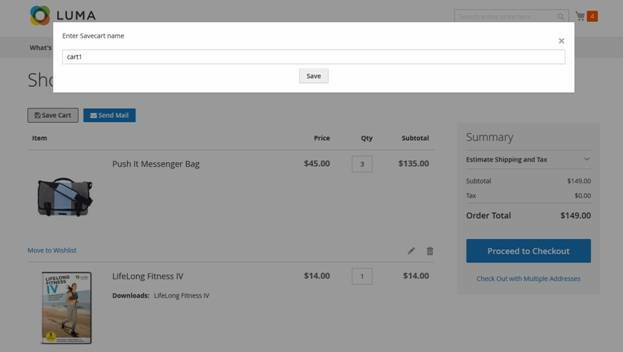 In the Account page, customers can manage their Save cart, allowing them to view/delete or add saved carts to Cart and complete the checkout step as they wish. The number of Save carts is unlimited. Shoppers can create multiple save carts in their account for the next shopping time. More interestingly, customers also can name their saved carts to manage their favorite items more easily. In every Save cart, the product information is shown in detail, thus, customers can have an overall overview of what products are saved to the next cart conveniently. Especially, users are totally able to share their Save carts through email with their friends and they can open email anywhere to view Save Cart without going to your site. Set up authorities for customers in front-end including: Create New Save Cart, Multiple Save Cart, Manage Save cart in Customer’s Account, Name Save Cart; Restore Saved Cart and Share through Email or Show Save Cart’s information for customers. 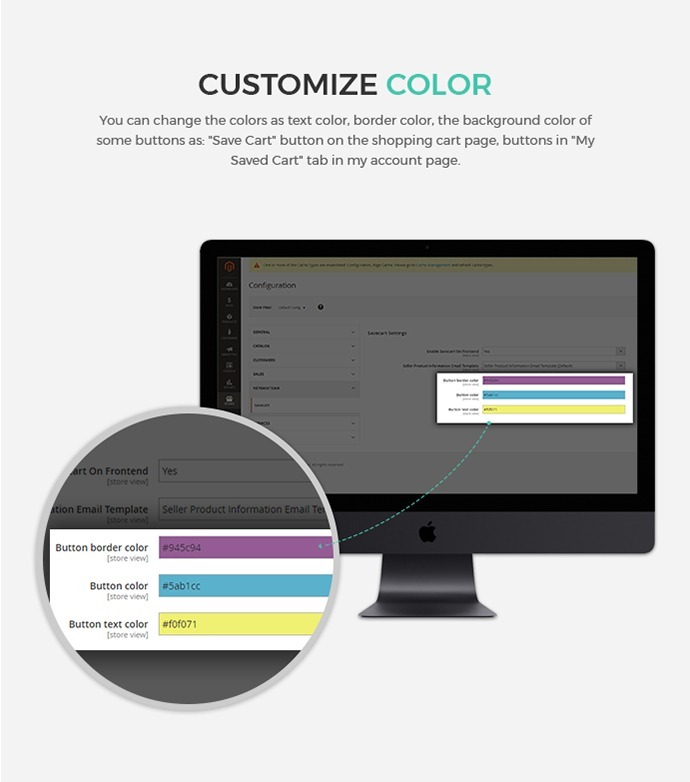 Customize Color: You are totally capable to change the colors as text color, border color, the background color of some buttons as: “Save Cart” button on the shopping cart page, buttons in “My Saved Cart” tab in my account page. 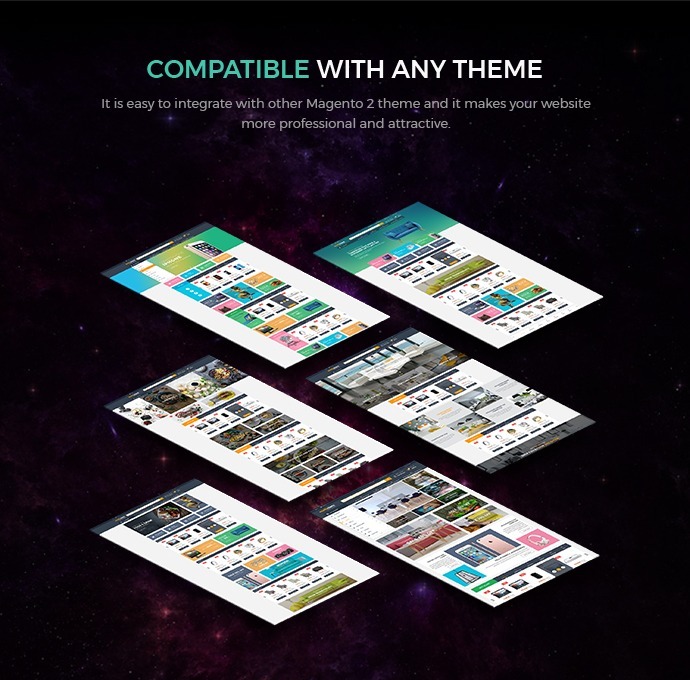 Do not worry because the Extension is Compatible with any themes: It is easy to integrate this product into any Magento 2 theme and it will increase your revenue immediately. The price is very affordable, ensuring that you have a cost-effective software but very amazing. Building simple steps somehow will be a certain foundation for your e-business to get success sustainably. Thus, never leave any tools that can help you conquer more customers and improve your customer-service. 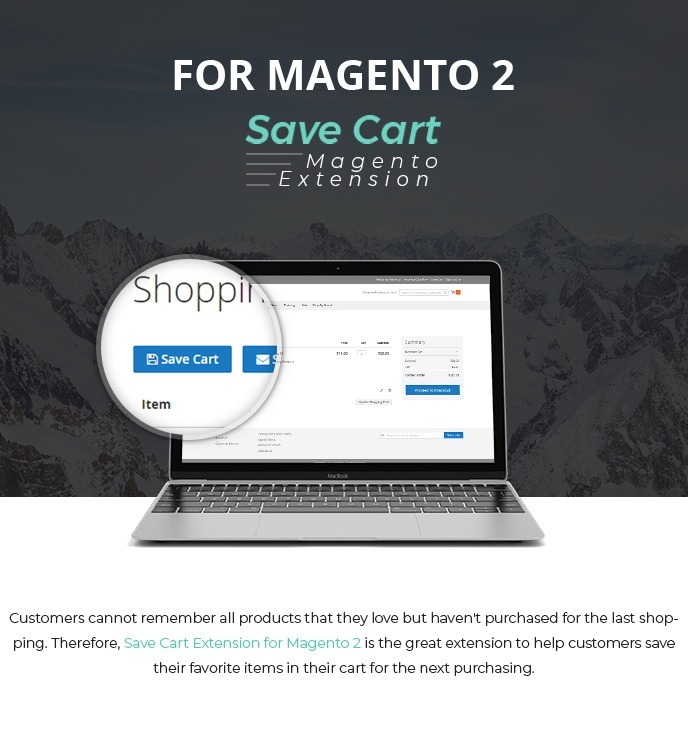 Installing the extension Magento 2 Save Cart to adapt your customer’s requirement and turn them into your dear customers, encouraging them to stay longer on your site and do more online sales.